Not everyone is in possession of a website with huge traffic or a well prospering social page, that’s why Shorte.st Referral Program is here! (which doesn’t mean you can’t use it if you do have a website, website owners can benefit from it alike). Sharing your shorte.st referral link is the first action you can take on the way to increasing your income specifically with the help from other shortening Ninjas. Moreover, participating in Referral Program can be a usual item on the list of your monetization methods and techniques complementing what you do daily. If you already tried your marketing skills in inviting your friends or acquaintances to shorte.st, you can surely say that while sharing your ref link is very easy, just copy and paste, convincing people to register with that particular link can be tiresome and success uncertain. To solve this issue and give you a tool that will bring you more referrals and more money, we came up with an idea of a special landing page which will direct visitors to a registration page through your referral link. Then, our standard procedure follows, you get a 20% commission on what your referrals (people who’ve registered with your ref link) will earn. But, this is not all. 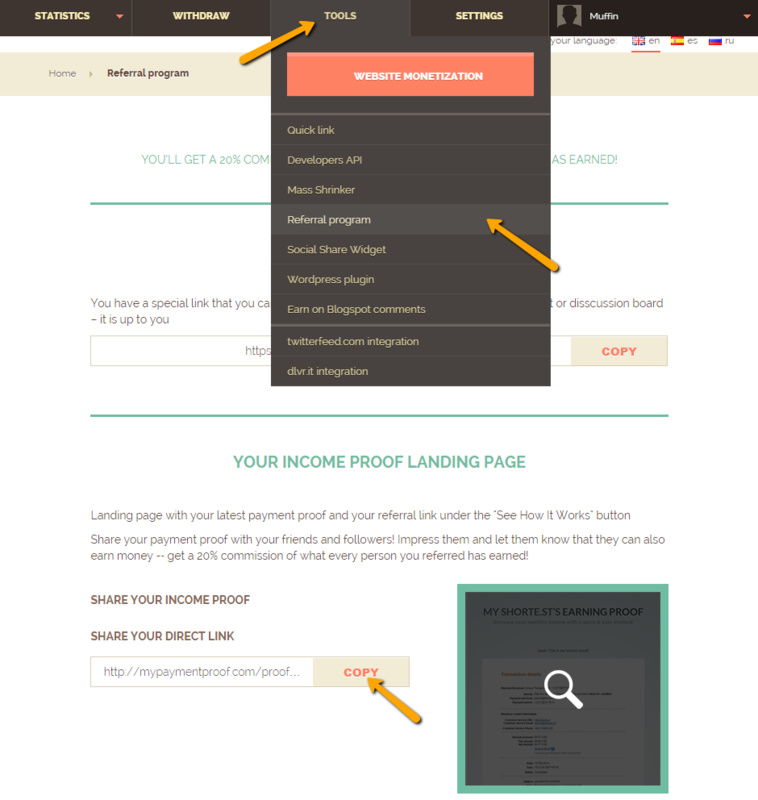 The awesomeness of the landing page mentioned above is that it will actually be your income proof landing page (and it will boost its potential siginificantly!). It means that once you receive your first payment from shorte.st, you’ll be able to use your transaction proof for your further good. And there’s nothing more thought and need provoking than a proof of real money earned. So, if you’ve received money from shorte.st, visit Referral Program and scroll down to find the landing page. As you can see, it’s enriched with Transaction details, which make it look credible, and a can’t-miss-it button engaging to start earning with shorte.st. By guiding users through in this way, the chances for registration on the following page are much greater. Share your landing page, see your referrals grow! Another aspect of acquiring new referrals is where you can share your unique landing page and the answer is everywhere! Or at least in every place where this won’t get you banned. You need to be careful with forums as plenty of them don’t allow any form of referral links in their posts. Out there you also have social pages, Facebook, Twitter, YouTube, even LinkedIn, articles or blog entries about earning online, Yahoo or Quora mentions where people are looking for answers. Just be creative and you will find a suitable place. If you are a website owner, placing it right on your site is a terrific plan too. Ready, steady, cash received, GO! If you still have your first money transfer from shorte.st ahead of you, remember about meeting all payment requirements. 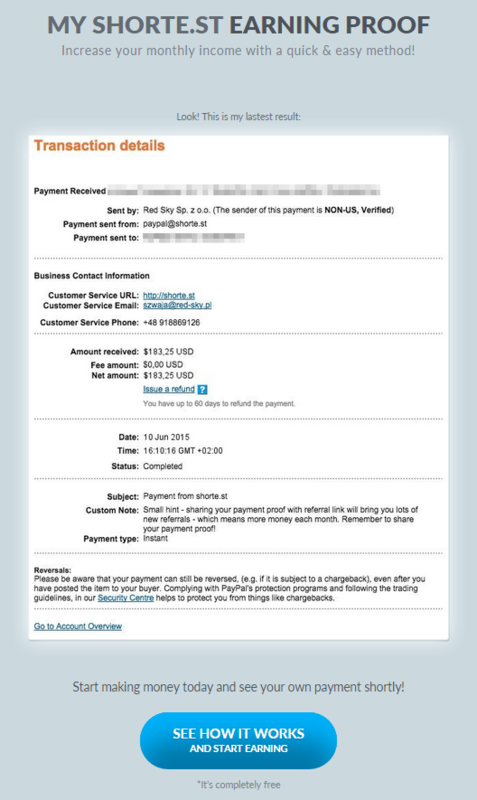 Only then you will be able to use your payment proof landing page. Feel welcome to drop us a line if you need to clarify some bits from the tips.